In round two we pit two variations on the Belgian Farmhouse Ale style against each other. Let’s start by meeting the contestants. Saison by Rockmill Brewery (Lancaster, OH) – Rockmill is a small brewery located in Lancaster, OH that makes Belgian style ales from organically grown ingredients. In a recent state-by-state guide to craft beer Imbibe magazine selected their Tripel as the craft beer that best represents Ohio. I don’t know about you, but I always think of Belgium whenever I see the occupants of the Dog Pound slavering away at a Brown’s game. Nevertheless, Rockmill make a quality, albeit a little pricey, product and to be honest not too many Ohio Breweries dabble in Belgian beers. Bam Biere by Jolly Pumpkin (Dexter, MI) – Jolly Pumpkin makes beer in a way that differs from most of their competition in the Great Lakes region: open fermentation, aging beer in oak barrels, and bottle conditioning. Their lineup of beers is heavily (exclusively?) populated by variations on the sour beer styles of Belgium. Bam Biere is their flagship (and most affordable) beer. It’s a Saison/Farmhouse Ale that is bottle conditioned and dry hopped, and comes in at a sessionable 4.5% abv. I’ve been wanting to try this beer for a while, and this matchup seemed like a great excuse to do so. The Rockmill Saison pours an orange-amber color with a yeasty, slightly sweet aroma that signals a Belgian style beer. It’s definitely got the fruity esters of a Saison, and a decent helping of hops that keeps it from being too sweet. However, it lacks the phenolic, peppery finish of a classic Saison and it suffers from a weakness that I find in all of the Rockmill beers. It’s just a little too heavy for my tastes, a little undercarbonated I guess. I gave it a 7.5 during the tasting, but on returning to this beer a couple of days later I think I was too generous. I’d say 6.5-7.0 is a more appropriate score. It would be quite good if they could do something to lighten up this beer a little. Bam Biere pours yellow and hazy with a faint Belgian yeasty smell. It’s a highly effervescent beer with a mild lemony citrus flavor, like a very restrained take on a sour beer. Its shortcoming is almost the opposite of the Rockmill beer, it’s so light, airy and subtle in taste that it seems a little like drinking Perrier water with a twist of lemon. With the small sample I had at the party there wasn’t enough of this beer to leave much of an impression on me and I gave it a 6. When I returned to the beer and had a proper sized sample I found that the lemony spritziness and acidity came out more as you got further into the glass. A 7 would be a more fair rating. It would be a good summertime session beer, but at $10 for a 22 oz bomber it’s a little too pricey for a session beer in my book. It’s tough to pick the winner because neither beer blew me away. During the party I gave my vote to Rockmill, but on further reflection I’m going reverse course and go with Jolly Pumpkin. I’m giving Bam Biere a slight edge because I think it occupies a more of a unique niche in the beer world. I can’t think of too many beers with the profile of Bam Biere (Sorachi Ace by Brooklyn Brewing may be the closest, but it’s a different beer), whereas if I was going for a Saison I think there are many better alternatives on the market to the Rockmill product (most of which are also less expensive). 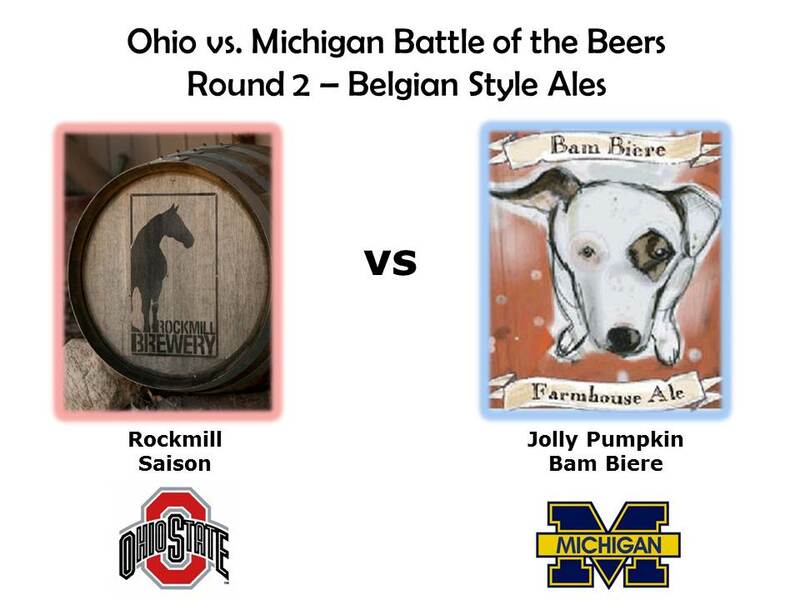 On a 1-10 scale I’d give Rockmill Saison a 6.5 and Jolly Pumpkin’s Bam Biere a 7. See the video below for the people’s pick. Neither beer was much of crowd pleaser. In fact looking over the score sheets left by the guests I see that no one gave either beer a rating higher than 5. In the video here my friend Ian compares Rockmill Saison to cough medicine, I totally bungle a question about the alcohol content of the Bam Biere, and the ballots reveal a close race between the two contenders. In retrospect I think an Indigo Imp beer might have been a better match to the Bam Biere.